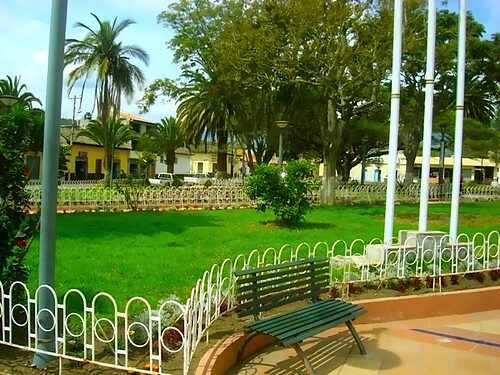 Ecuador real estate offers special value in Urcuqui. See below two ways to learn how you can save as much as $78,000 on a half acre Ecuador building lot like this. Readers at our various sites know that we continually seek ways to find value for our readers. We are obsessed with value which is one reason we invested in large amounts of Ecuador real estate. This is why 15 years ago our message became… buy Ecuador real estate! Ecuador real estate offered incredible value almost everywhere… back then. Over this last decade and a half… thousands of expats from the USA…. from Canada and from Europe have moved to Ecuador. Ecuador real estate prices have risen. Many people have moved in taking advantage of others and many are expats themselves. Now, one has to work hard to find really special Ecuador real estate values. We take this responsibility to help our readers to avoid scams and ripoffs and find value in Ecuador real estate seriously. Jean Marie went far beyond researching and writing about Urcuqui however. He went to work to create some special value for our readers and his real estate tour delegates. He contacted the Mayor of Urcuqui and has helped create some spectacular value for you. Here is Jean Marie’s report on a special way to save with value from Ecuador real estate in Urcuqui. 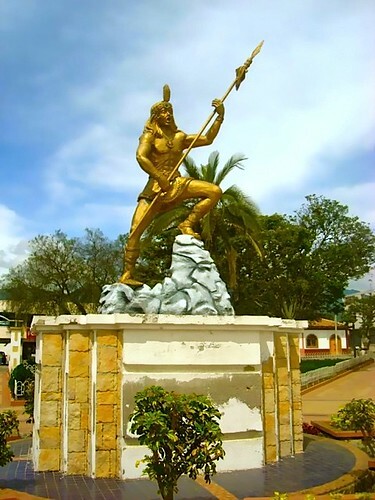 Urcuqui, the Best Deal in Ecuador Real Estate? I have just met the Urcuqui mayor, Captain Nelson Felix Navarrete, a retired commercial pilot who is eager to transform Urcuqui into the next Cotacachi. 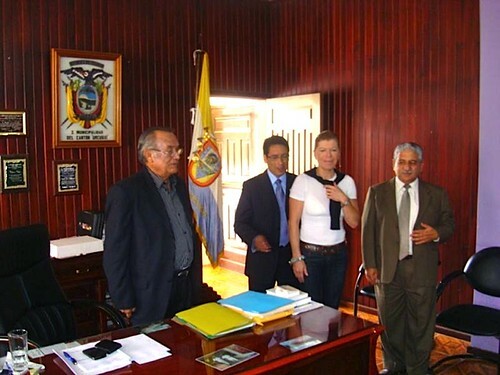 Pascale Butterlin with Mayor Nelson Felix Navarrete. Photo by Jean Marie Butterlin. Mayor Navarrete has already improved this little city of 5,000 a lot. 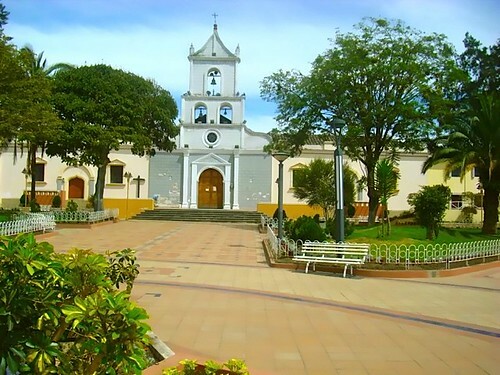 Urcuqui is 15 minutes from the provincial capital Ibarra and 45 minutes from Cotacachi on the way to Chachumbiro Spa. 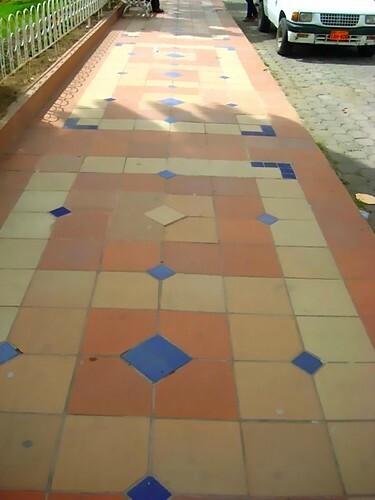 The town has put in new paved sidewalks. Urcuqui is a very old town. 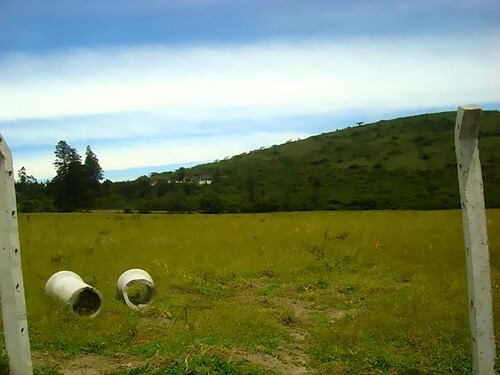 Records about the indigenous’s construction of a very advanced irrigation system date back more than seven centuries. Urcuqui is very quiet and… very secure. Everyone knows everyone so crime is low. 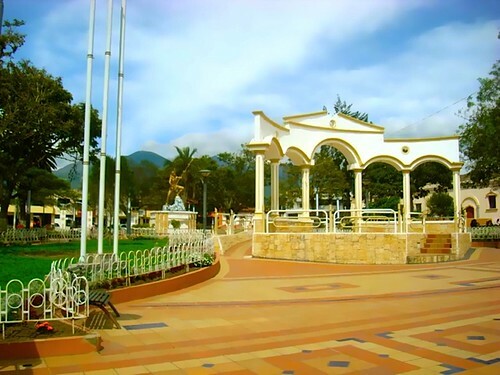 Because it is at a lower altitude, Urcuqui has a warmer climate than Cotacachi or Otavalo. There is very rich soil, plenty of water and no air pollution. I have seen a lot of very old folks walking around. The mayor pointed out that there are quite a few people that are close to 100 years old living in and around the city. 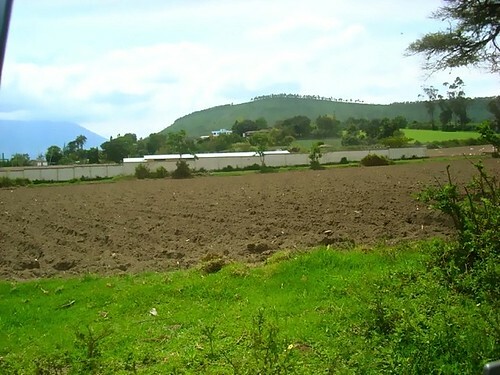 The mayor and the city counsel are taking steps to buy 10 hectares (22 acres) of land, minutes from the city center and resell it in 1,000 m2 to 2,000 m2 (10,000 to 20,000 square foot lots) at the municipality’s cost to anyone who will come and build a home. Entrance to new land available from the municipality. This means that a 1,000 m2 (10,0000 square foot) lot (with water, sewage and electricity) can be purchased for between $1,000 to $2,000. Similar lots in Cotacachi now run between $20 to 40/m2 ($2 to $4 per square foot) in Cotacachi or Otavalo. Good house construction is ranging between $350 to $450/m2 ($35 to $45 a square foot) so the total cost of 150m2 (1,500 square foot) home is around $60,000. Urcuqui is best suited for people who like small cities. There is plenty of farmland available for those who would like to buy a farm. 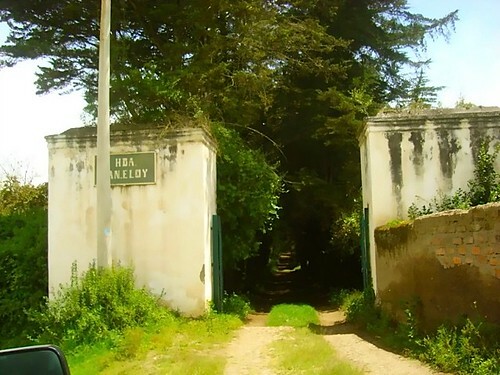 There is a nice 350 hectare (840 acres) hacienda for sale. Delegates on our next Imbaburra tour will be the first one to visit Urcuqui, this hacienda and all the available lots sold directly by the city. The mayor of Urcuqui is also responsible for the entire canton which includes several hot thermal springs just about 15 minutes away like Chachimbiro. For those who would like to look at a business opportunity, I have discovered a little spring that lies on city owned land. 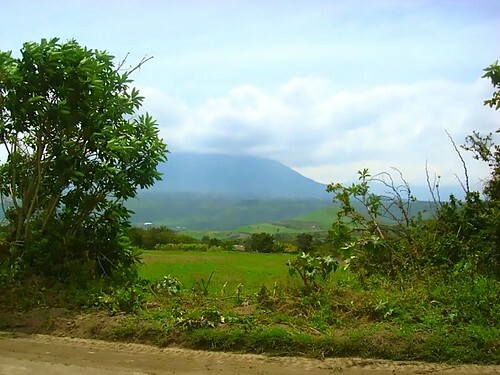 This spring has special mineral qualities and we will inspect this property as well during our next Imbabura tour. There you have it. 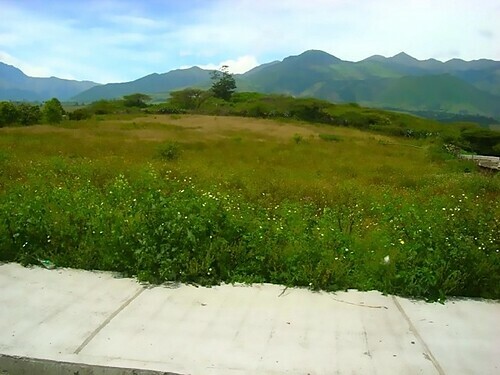 A great, large good view building lot in Cotacachi could be priced as high as $80,000. A similar lot in Urcuqui… $2,000. That’s real value. Building prices are also lower since labor is not so much in demand in Urcuqui… yet. Bargains like this will not last long either. When we expose this type of opportunity it is only a matter of time before a flock of readers become buyers and create upwards pressure on the prices. Therefore we are limiting our exposure to our premium Ecuador Living subscribers and delegates at our International Investing and Business seminars and Jean Marie’s Ecuador real estate tours. Merri and I are pleased to be able to share this special value for those who want create a home, with low cost, healthy living as they enjoy special value. 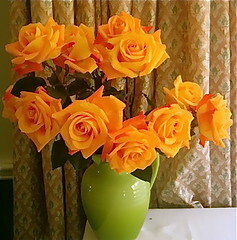 Three days left to order Ecuador Valentine roses. See how to Join Jean Marie’s upcoming Imbabura real estate tour and see Ecuador real estate in Urcuqui. See details on how to join this Ecuador real estate tour here. Learn about Urcuqui Ecuador real estate at our upcoming Mt. Dora International Investing & Business Course.